Dawar Technologies began in 1883 as a commercial printer and typographer under the name Warde Press. A later partnership with Frank Davis led to the name change Davis and Warde, which existed until 1998. For many years we produced high-quality annual reports and corporate brochures for Pittsburgh-based Fortune 500 companies and others. During the mid-’70s, a screen-printing operation was started in-house producing posters, banners, and signage which eventually evolved into printing on polycarbonate film in the mid-’80s. 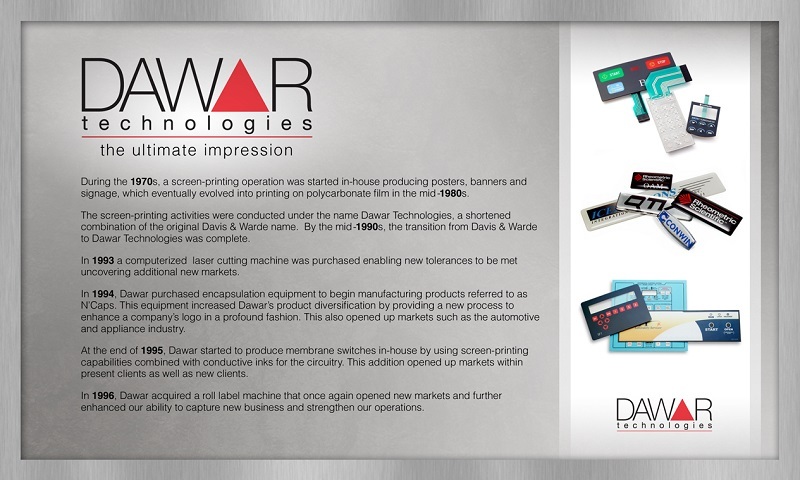 In 1985 Dawar Technologies, a shortened combination of the name Davis & Warde, was formed to accommodate the increased market activity in screen-printing. Throughout the late 80s and early 90s we continued to expand our screen-printing capabilities with computerized laser cutting machines and encapsulation equipment. Dawar began producing membrane switches in-house in 1995, using our extensive screen-printing capabilities combined with conductive inks for circuitry. Our membrane switch business expanded quickly, requiring outside investment to continue our company’s growth. On May 29, 1998, a partnership group acquired Dawar Technologies, providing us with the means to expand our business through significant investments in sales, production, and acquisitions. During the spring of 1999 Dawar moved into a 24,000 square-foot building on Pittsburgh’s North Shore. From our new location we continued to expand our product base including a significant investment in milling, implanting, and encoding equipment for the emerging high-technology market of smart cards. 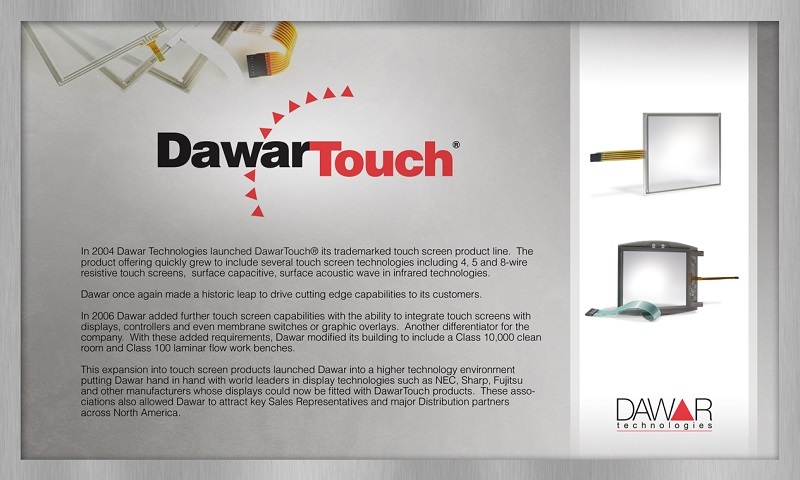 In 2004 Dawar entered into a new era with the introduction of DawarTouch®, a line of resistive touch screen products. With our extensive experience in screen-printing, membrane switches, and smart cards, resistive touch screens were an obvious next step in the evolution of Dawar as a designer and provider of user interface hardware. Our next step was the addition in May of 2007 of a new Class 10K clean room to produce high-quality touch screen integration products. Increased demand for our resistive touch screen productsd continued until once again we outgrrew our building. At the end of 2008 Dawar moved to a 47,000 square-foot facility on the North Shore of Pittsburgh just up the street from Heinz Field. When we moved into the new facility we also expanded our 10K clean room to accommodate new equipment. In 2012 Dawar Technologies began manufacturing projected capacitive touch screens in our Pittsburgh facility’s 4,000 square-foot class 10K clean room. We became an EETI design partner, receiving in-depth training from EETI on designing for and supporting their line of PCAP touch controllers. Our line of PCAP touch sensors expanded to include sizes from 4.3” to 24” using EETI printed circuit boards (PCBs) and chip-on-flex (COF) touch controllers. All sensors were designed and tuned in-house by our highly technical engineering staff. In 2015 Dawar Technologies sold several legacy businesses to JN White Designs including in-house manufactured labels, graphic overlays, and membrane switches. Divesting ourselves of these products focused our strategic initiatives on touch screen products and integration services.At the same time we invested in capital equipment to add a liquid optical bonding production line in the Pittsburgh facility. Dawar expanded our touch controller capabilities by becoming an Atmel design partner in 2016, allowing us to expand our product offerings and support a wider variety of applications and vertical markets. We designed and built our own set of PCBs and COFs using the Atmel T and U series touch controller chips to mate with our in-house designed touch sensors. Our engineering staff attended Atmel trainings, enabling us to provide direct support and tuning for our new line of Atmel-based touch sensors. As our markets expanded and volumes increased, our expert supply chain staff began searching for reliable Asian partners to help us extend our product capabilities. Throughout 2017 and 2018 Dawar partnered with several off shore manufacturers. With these partnerships we were able to support higher volume projects, new sensor constructions, and larger sensor sizes, all while lowering our customers’ costs. In June of 2018 we established a Dawar Technologies office in Taiwan to facilitate these overseas partnerships by adding Dawar engineering, supply chain, and sales support. Dawar Technologies continues to provide PCAP and resistive touch products to an ever expanding customer base. Our integration services have grown to include dry and liquid optical bonding, custom cover lenses, EMI shielding, TFT sourcing, display drivers, custom cabling, and more. Our unique combination of on-shore and off-shore production capabilities provides our customers with the best of both worlds: local engineering support with overseas sourcing. But the real stars of the Dawar Technologies story are our people. For 130 years we have provided exceptional customer service for a wide variety of markets and products, and today is no exception. Our talented teams of engineers, customer service reps, supply chain specialists, quality inspectors, sale managers, production personnel, and management staff continually provide our customers with the quality products and support you need to expand your business. By involving our teams early in your product design cycle, you can take advantage of our extensive experience in designing and building touch screen based products. Call 1-800-366-1904 for more information!